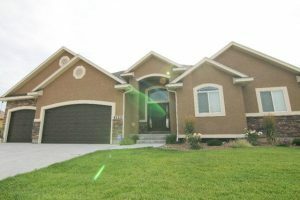 Situated in King’s Island, this stunning newer home backs up to the Sage Lakes Golf Course. It has a stately, full stone and stucco exterior, 8/12 hipped roof, grand entrance, and a 4 car double-deep garage. This home features all of Fall Creek Home’s extraordinary features, as well as the following: It features a welcoming Grand Entry, with custom tile work and soaring high ceilings, a gorgeous living room with custom framed windows, fireplace, vaulted ceilings, and 9′ main floor walls. A kitchen with custom cabinets, granite counter tops, finger-print free stainless steal appliances, travertine back splash, upgraded oil-rubbed bronze fixtures, and hardware, a walk-in hidden pantry, a raised kitchen island, French atrium doors, and beautiful tile. The Master Suite is simply designed to please with a jetted tub, separate tile and glass shower, wood framed mirror, walk-in closet, tray ceiling, crown moldings, USB outlets. All standard bedrooms have two closet doors with space-saver organizers built in. Creature comforts include a 96% efficient, two-stage furnace, low e energy efficient windows, and NEST thermostat (SMART phone operable). Sante Fe texture throughout. Three tone paint. Upgraded carpeting with 8 lb. pad. MUCH, MUCH, MORE! Check out this 3d virtual tour below! For any questions, please reach out to Zac Martin of The Group Real Estate.